As the first full-featured Linux based operating system (OS), Cumulus Linux has injected great possibilities and new vitality in networking field in these two years. Due to its great effort in open networking, Cumulus Linux has been one of the three leading OSs in the market. The another two are IP Infusion OcNOS and Pica8 PICOS. Recently, the collaboration between FS and Cumulus Networks has been made. The N-series open switches from FS will be pre-installed the latest Cumulus Linux OS to customers. At the moment of their joint effort in achieving open networking, we are going to make an analysis of the similar features of the open manageable switch supported by Cumulus Linux. 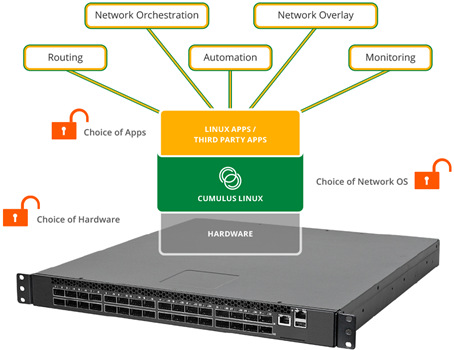 Cumulus Linux is a flexible open network operating system, which can be installed on various open switches, including the layer 2 switch and layer 3 switches. The code used to build Linux is free and available for users to view or edit. Therefore, it looks like the world’s largest data center that allows users to automate, customize and scale using web-scale principles. After the installation of the Cumulus Linux OS, the open switch can act as a Linux server. 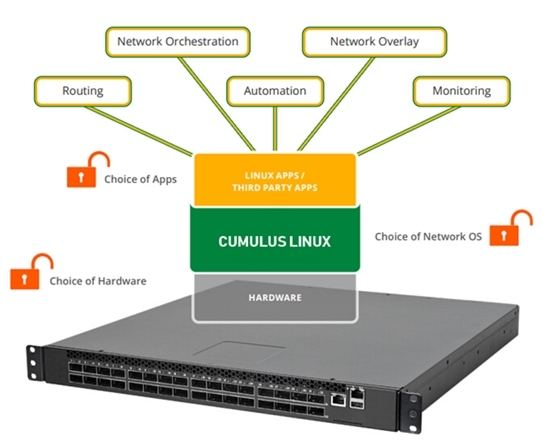 Featured with supporting a broad partner ecosystem, the Cumulus Linux gives customers more options and flexibility in data center networking regarding switch type, CPU, chip type, and supported transceivers. Generally, open switches that support Cumulus Linux are bare mental switches coming with open network install environment (ONIE). In that case, no matter you have a brite box switch like Cisco switch, or a white box switch like FS switch, Cumulus Linux can be accessible to them. Nowadays, in the market of open switches, the 32-port and 48-port switches with 40G/100G transmission speed are commonly applied by enterprise users. Considering their high-density and greater agility needs for networking, the open switches are mostly layer 3 switches so as to achieve spine-leaf or overlay architectures. The open switch CPU that supports Cumulus Linux OS usually comes in three types: ARMv7, PowerPC, and x86_64. Among these three types, x86_64 is the most popular one, adopted by most vendors, such as Dell, HPE, Mellanox, and FS. Currently, Broadcom chip and Mellanox chip are the major roles of switch chip. The Mellanox type is usually used by Mellanox itself or Penguin. Therefore, the Broadcom type dominates the largest switch chip market share, installed by the most brand vendors or the third party suppliers. Since most open switches support high-speed transmissions, the matching transceivers are QSFP28, QSFP+, and SFP28. 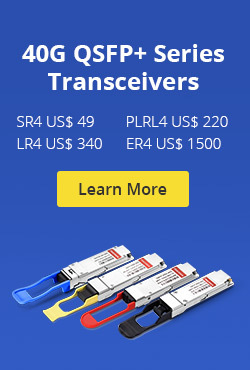 Only some 10G and 1G open switches will need to use SFP+ and SFP transceivers. By the way, viewing the trend, you will find 25G Ethernet has been deployed by many enterprise users in recent years for high bandwidth need. Accordingly, the 25G open switch has been a more economical and efficient choice than 1G or 10G switches. Also, the 25G switch will be the best solution to pave the road for the upcoming 100G/400G Ethernet in the future. Just like the agility and simplicity the Cumulus Linux has advocated, it brings a truly economical and open network environment for users. With so many choices for open switch type, CPU, chip, and supported transceivers, it liberates the choices for open switches, which begets an open networking market in the end. This entry was posted in Fiber Optic Switch and tagged 48-port switch, bare metal switch, brite box switch, Broadcom chip, Cisco switch, onie, open switches, switch cpu, white box switch, X86_64 on January 5, 2019 by Camilla.Zhang. With the higher and higher demand for network agility and scalability, traditional networking has been no longer satisfying. In that case, the open source network has been an urgent need. To meet with this new trend, here comes our open switch, a great contributor to the open networking. Open switches refer to switches in which the hardware and software are separate components that can be changed independently of each other. 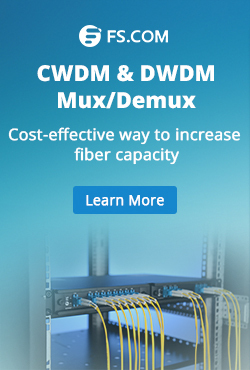 That means you will gain more flexibility to tailor your own network switch. Conventionally, the open source switch in the market can mainly be classified into the bare metal switch, white box switch, and brite box switch. The open hardware means the hardware of an open switch can support multiple operating systems (OS). This is in contrast to closed switches, in which the hardware and software are always purchased together. For example, if you buy a Juniper EX or MX you also buy JUNOS; if you buy a Cisco Catalyst switch you buy IOS. However, things will be different with open switches. In the context of that, no matter which type of open source switch you are using, it’s possible to support many operating systems instead of a proprietary one. By the way, the hardware manufacturers of the open switch are primarily Taiwanese, including Accton, Quanta QCT, Alpha Networks, and Delta Computer. These same companies are original design manufacturers (ODMs) for many of the mainstream switch vendors. The open software signifies that an OS can be run on multiple hardware configurations. As we mentioned before, you don’t need to buy an OS from the original brand of your switch hardware. For example, if you have Cumulus Linux, you can buy a layer 3 switch without a brand label. They still work well with each other. In the past, most people have no choice but to use brite box switch that integrates OS and hardware of branded suppliers. Now, with an open switch software, choices and economic efficiency will be largely expanded and improved. Generally, there are three popular open softwares in the market: Cumulus Linux, IP Infusion OcNOS and Pica8 PICOS. With an open source switch, more flexibility, and options can be enjoyed. There is no need to configure your switch as in the past or wait for vendors to release new software or hardware. It brings the open source network to operators, enterprises, third-party vendors and network users, accelerates the innovation speed of new services and functions of the network deployment, and takes users closer to SDN (software-defined network) and NFV (network functions virtualization). The network simplicity and reliability can be improved through the automated centralized network device management, unified deployment strategies, and fewer configuration errors. The network flexibility and scalability have been greatly increased, which will also save much cost and time for IT workers and enterprises. In this post, we make an exploration of the open switch. From the introduction to its hardware, software, and benefits, we can understand why the open switch has been a great facilitator for open networking. This entry was posted in Fiber Optic Switch and tagged bare metal switch, Cumulus Linux, open networking, open software, open switch, white box switch on December 21, 2018 by Camilla.Zhang. Today, nearly all mainstream organizations use traditional (integrated) switches from vendors like Cisco, HP, Arista and Juniper. However, hyperscale folks such as Google, Amazon and Facebook are taking the lead to use white box switch or whitebox switch in the portion of their networks, operating the system in a different manner. So what is the magic behind that? Are these OTTs the only customers of white box switch? You may find some hints in this article. What Makes White Box Switch Special? White box switches consists of generic and inexpensive hardware and a preload network operating system (NOS) that can be purchased and installed separately. Often the hardware and software come from different vendors. This is in contrast to a traditional switch that comes as one package including the hardware and the software. For example, when you buy a catalyst switch from Cisco, you are obliged to use Cisco IOS as its operating system. But with white box switch, you are allowed to buy hardware and software separately. Except offering increased software flexibility/programmability and reduced vendor lock-in, white box switch enables users to have multiple choices on hardware, network operating system (NOS) and applications. The impact of which is profound when it comes to network orchestration, routing, automation, monitoring and network overlay. What About the Target Market of White Box Switch? White box switch is initially designed for data centers. Companies that operating mega data centers are especially prefer white box switch for at least two reasons: these companies generally demand for massive deployment of switches and the port density of each switch needs to be high. White boxes are cheaper while offering high-density ports, hence proven to be an optimal alternative. On the other hand, these large-scale companies also value the flexibility and openness of the switch platform, besides CAPEX savings. As an open platform to offer broader flexibility, white box switch free them from traditional L2/L3 protocols, enabling more possibilities to develop and support any SDN based networking. So, are these large-scale OTTs the only target market for the cheap white box switch? Definitely No! Any small or medium-sized cloud based providers, or data center of service providers can consider deploy white box switches in data centers, concerning the cost savings and enhanced flexibilities compared with traditional switches. Also because of the familiar IT tools/ commands their technicians are used to. However, white box switches are not yet ready to offer all features and services that a service provider needs to offer, and not yet for deployment in non data center environments. Based on an open platform, white box switch offers greater possibilities for innovation when compared with traditional networking gears. As the number of vendors that specialized in developing software began to soar, customers can choose from a range of software solutions with added functionality and reduced price. White box switch becomes even popular in this age of SDN. 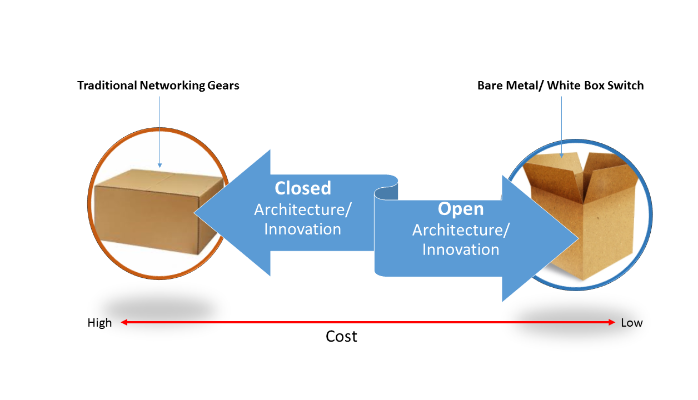 In traditional switches, software and hardware are integrated into one package, which limits the network innovation greatly. SDN is here to decouple the software from hardware, helping speed shifts in networking. It resembles the standpoint of white box switching. Moreover, the advert of SDN also drives white box forward: when combined with SDN-centric designs, these deployments have resulted in dramatic improvements in automation, operational simplification, and faster innovation. These benefits are now being realized by enterprises of all sizes via commercially available SDN solutions. Despite the fact that white box switches cannot be applied in non-data center environment for the time being, they are meeting their target market requirements successfully. The potential of white box switch cannot easily be underestimate, it is an ideal alternative that worth to be seriously considered at least for data center applications. This entry was posted in Fiber Optic Switch and tagged cheap white box switch, data center, white box switch, white box switching, whitebox switch on July 7, 2017 by Admin. White-box switch is nothing new to us. ODMs (original design manufacturers) have been building hardware for well-known vendors for many years. These vendors take the ODM hardware, install their operating system, and sell the unit as a bundle, often attaching a support contract. Until now many companies like FS are also getting into the game of producing white-box switches. White-box switches look just like any other switch, which are gaining increasing attention in next generation data center deployments, with many software-defined networking (SDN) startups offering solutions that include them. Enterprises are wondering how white-box switches will impact their data center plans. So what are white box switches? What Is a White Box Switch? A white box switch is a network switch which comes with an installed operating system. It can be used as a standard for the base of hardware system elements. In the case of operating systems, white box switches are generally preinstalled on the system, or can be installed later. Loading of the white box switch is not difficult and can be done in a short period of time. They are generally used with SDNs and particularly useful in terms of a networking approach where the control is generated from the physical infrastructure after decoupling it. It can act as an efficient open-source tool for management of materials and information on a device. And the major difference between traditional black box switch and white box switch is that the first one can’t be programmed but the later one can be programmed. With white box switches, a service can be programmed by using switch controller like ONOS while traditional black box switch provides very limited features and every time when you need to update something you have to log into switches and then change the rules. The white box switches are flexible, fast and inexpensive, which is why many opt for this type of switch. 3-year ROI. A low-cost product can get ROI (return on investment) in less time and be replaced sooner. Faster hardware rotation equals more innovation/feature adoption. Software bugs. Vendors take months to locate, accept, and fix bugs, which has enormous impact on your business. With OCP-compliant white boxes, you can switch software and keep your business alive, or work around slow vendor support. Self-sparing. For some/most use cases, self-sparing is better than relying on vendor inventory. When products are cheap, you can hold inventory in your data center and bring MTTR down to hours instead of days. Cost and reliability. What the customer is often paying for is the software that rides on top of the hardware and the logo. From a reliability standpoint, white boxes are on par with brand-name systems because they are actually the same hardware. SDN. Move your operational focus from a vendor-specific CLI to an SDN solution. If you’re concerned about having multiple vendors to operate, then buy a SDN solution that is device independent. Network operations. Many engineers may ask questions like “Do I have to write my own operating system?” “How do I install a network operating system” “What do I buy?” when considering a white box switch. Now, they can be reassured because white boxes can now be purchased from mainstream network vendors such as FS and HP. Also, when one purchases a white box, those suppliers will offer the kind of technical support most engineers need. White boxes are certainly ready for mainstream adoption. Although they aren’t for every use case, but in the right situation, like an SDN deployment, they can be as good or better than traditional switches with a much lower price point and equivalent operational costs. If you want to purchase one, you may visit FS.COM where you can find the best-value and cost-efficient white box switch. This entry was posted in Fiber Optic Switch and tagged black box switch, network switch, white box switch, white box switches on June 22, 2017 by Admin. Network switch can be considered as the heart of the telecommunication network, especially when the fiber optic network is being widely deployed. A good switch usually has high requirements on both hardware and software. Switch vendors usually bounds the hardware and software together, which means, if you choose a vendor’s switch, you will have to use their software. Thus, the switch market of telecommunication network has been monopolized for many years by several large vendors like Cisco, HP, Juniper network, etc. And the cost of their switches is usually expensive. In the recent year, these traditional switch vendors are being challenged by a new type of switch which is called white box switch. Confusion and controversy about traditional switches and white box switches have never stopped. What’s the Magic of White Box Switch? The biggest difference between white box switch and traditional switch is the software of the white box switch is not dependent on its hardware. If you bought a white box switch from one provider, you can also use the software from another provider. This allows the customers to flexibly design and set their network and switches. This features makes the white box switches become very popular in SDN (Software Defined Network). Customers can program white box switches to create routing tables and route connections by the using of OpenFlow protocol or another south bound API in SDN environments. In another aspect, the white box switch is usually much cheaper than the traditional switch, which makes it become popular for both large data center and smaller network. Most white box switch has high port density. Some large companies like Facebook, which need massive switches to be deployed in their data centers. The using of the high density white box switch would save a lot. They don’t need to depend on the traditional switch vendors. Meanwhile, they are able to customize their white box switches to meet the specific requirements for networking and business. The price and flexibility of the white box switches are also very attractive to some small network. Some might get confused about the quality of the white box switch, because they are so cheap. Actually, the hardware of most switches is coming from the same company, what the customers pay for is usually the software and the logo of the traditional switch. The white box switch can also provide high performance. Will White Box Switch Change the Future? The white box switch can have as good or even better performance in SDN applications compared with traditional switch. However, it has great advantages on the cost, flexibility and applications. We don’t know how things will go in the future. But it is sure that white box switch will make some difference. According to the survey, more than 90% of the operators thought they will deploy the SDN in some point in the future, which means the white box switches are also being looking good in the future. Even some larger vendors are thinking about providing white box switches. It is sure that the white box switch is at its very early stage, but it is providing tremendous potential for our telecommunication network and many data centers or server rooms. It is apparent that the traditional switch will still be an important role of the telecommunication network and data centers for a long time. However, benefits of the white box switch and SDN won’t be ignored. The fierce competition in white box switch market is also a great promoter. No matter how the future will go, it is worth trying for the deployment of the white box switch and SDN. This entry was posted in Network Solutions and tagged network switch, white box switch on April 8, 2017 by Alice Gui.